Here are some of the machines utilized in the Manufacturing Plant of Dok Alternatibo. It is located in Digos City, Davao del Sur, Philippines. Most of the machines are manufactured by Payo-Dok Alternatibo Technologies the number one manufacturer of Agro-Industrial Machineries in the country which are products of Filipino ingenuity. The company already received various awards in the field of inventiveness and creativeness, the highest of which is the Presidential Award. Providing only the best and quality products to our advocates worldwide! Packaging machine for tea bags has the function of auto filling, bag sealing, thread affixing, external bag heat sealing and auto counting. It conforms to food hygiene standard and low-cost high efficiency ideal equipment for tea and foodstuff industrial sector. It is mainly used packaging of medicine tea, beauty-smiling tea, health strengthening tea or other similar fine-particle products. Mainly uses in packing fine-grain, pellet class drugs, hard sugar, coffee, fruit treasure, tea, monosodium glutamate, salt, seed and drying agent. It is suitable to aspect of medicine, food, chemical industry, agricultural chemicals small bag packaging and so on. This machine makes different sizes of Capsules. Filling is possible through exchanging of parts. It is used by the industries such as chemical, pharmaceutical, animal food and food. Suitable for better weight accuracy by speed adjustable turntable, lower noise level by unique precision transmission, precision & solid construction for stable & long lasting operations. This manual operated sealer was designed for packaging applications, small quantity and occasional sealing applications. This machine seal polyethylene and other thermo-plastic films. Production speeds vary according to the type and thickness of the film and operator’s skill. It plays the function of not only the polishing for capsules and tablets but eliminating static electricity. It can also automatically reject low weight capsule, loose piece and fragments of capsules. It is suitable for all sizes of capsules without the need to change parts sorter: this capsule sorter is used to select out the empty capsules, loose pieces as well as scraps after capsule filling. It can also automatically select out those capsules with lighter dosage. The machine can be connected to the main production line. 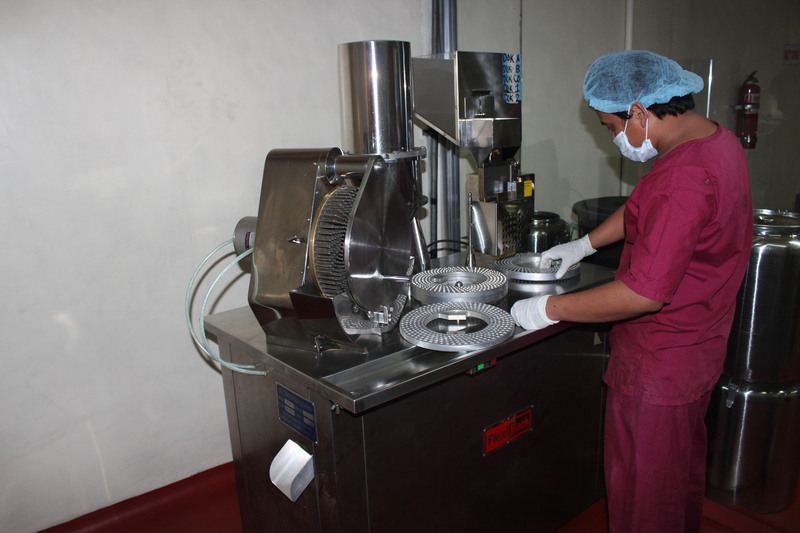 The capsules can be polished after sorting process which is more suitable for SR capsule dosages. This machine is in small size, light weight, easy to operate small batch and diversified production for middle-small enterprises. Its adjustable stroke can change the sheet size freely and suitable for the productions of different specifications. Its plate-type construction is suitable for packing the matter of any shape such as the special matters of square, triangle and oval shape and etc. Positive-pressing formation makes blister wall uniform, stiff and smooth it also makes the packing finished products more beautiful. Forming, feeding, heat sealing, pressing, batch number printing cutting and waste recovering can be completed automatically. This machine is made of stainless steel; it is set with man-machine touch screen & equipment sensor. You can change different languages, counts the products you produce and so on. It is in beautiful shape, multi-functioned and meant for longer use. One person is enough to operate this machine and you can always set the quantity you want to produce through man-machine touch screen. The simple structure of the machine enables you to understand at once. One person is enough to operate this machine, which is convenient for modern administration and saves the manpower and could improve efficiency. It is clean with full waste recycling system thus reduce the usage of PVs material. 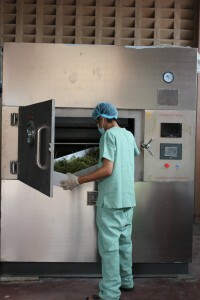 Microwave vacuum and drying equipment, which combines the microwave energy and vacuum technology. This is a kind of new type microwave energy application equipment. It does not only have advantages of microwave and vacuum drying but also overcome shortcomings of general vacuum equipments, such as long drying cycling time and low efficiency. As for general drying courses, microwave vacuum characterizes big drying output, good quality and low cost processing etc. It is well-known that when air pressure reduces, water boiling point will reduce too. This very easily operated desktop impulse sealer is and absolutely necessary help in every case, when there is anything to be packed or bags to be sealed. The desktop machine is appropriate for sealing thermoplastic material. It is adjustable sealing time for the different films, impulse sealing in one line manual hand press model integrated safety cutting knife. Click here to buy our Laboratory Equipment exclusive from our direct supplier abroad!